A complete step by step tutorial on Role of PCB in Modern Life. Hello friends, I hope you all are fine and will be doing something special in your life. 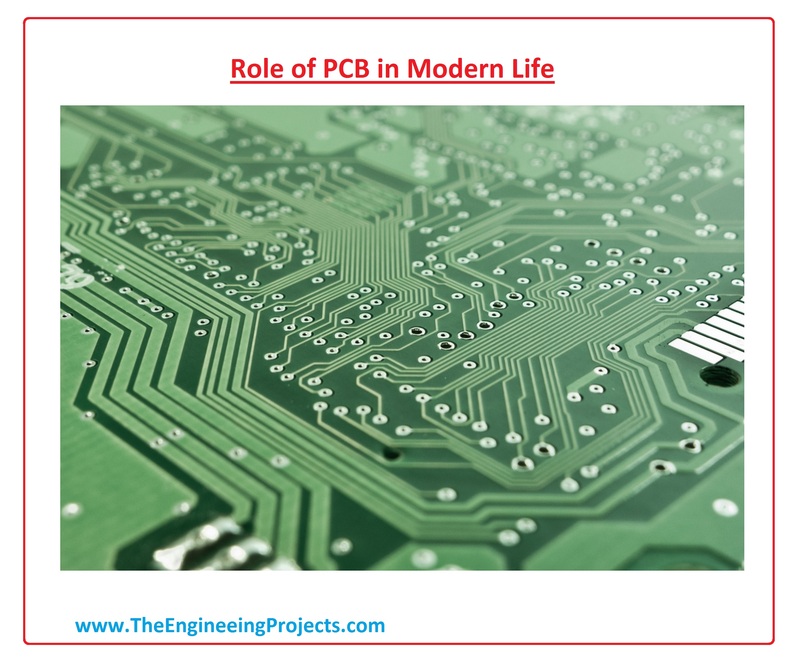 In today’s post, we are going to discuss The Role of PCB in Modern Life. A PCB is a thin board made of fiberglass, composite epoxy or other laminate material. A conductive pathway is etched onto the board connecting different component on the PCB, such as transistors, resistors, and an integrated circuit. PCB is used in both desktop and laptop computers. It serves as a foundation many internal computer components such as video card, network interface card, controller card, an expansion card. These components are connected to the motherboard, which is also a printed circuit board. PCB is used in different industrial projects and electronic devices. PCB can be single sided, double sided or multi-layer. Large no of PCBs can be fabricated at the same time. PCBs can also be made manually in small quantities, with reduced benefits. In today’s tutorial, we will discuss its role in our life, working and also discuss electronic devices in which it uses. If you have any question about PCB, its construction and design, please ask in a comment I will try my best to resolve your problems in a comprehensive way. So let’s start with the Role of PCB in Modern Life. Before the development of the printed circuit board, the circuit was wired point to point on chassis. The chases were a sheet of metal frame or pan. The circuit on chassis was large, bulky, heavy and relatively fragile. Its production was labor-intensive, that way projects were expensive at that time. With the passage of time, as technology improves Austrian engineer Paul Eisler invented the printed circuit as part of radio set while working in the UK around 1936.In 1941 multilayer printed circuit used in German magnetic influence naval mines. In 1943 the USA began to use the technology on a large scale to make proximity fuses for use in World War II. After World War II PCB was available for normal life use in different products. After PCB brief history now we discuss modern PCB. A modern PCB consist of a flat sheet of insulating material and a layer of copper foil. Chemical etching divides the copper into separate conducting lines called tracks or pads for connections. The tracks function as wires fixed in place, and are insulated from each other by air. 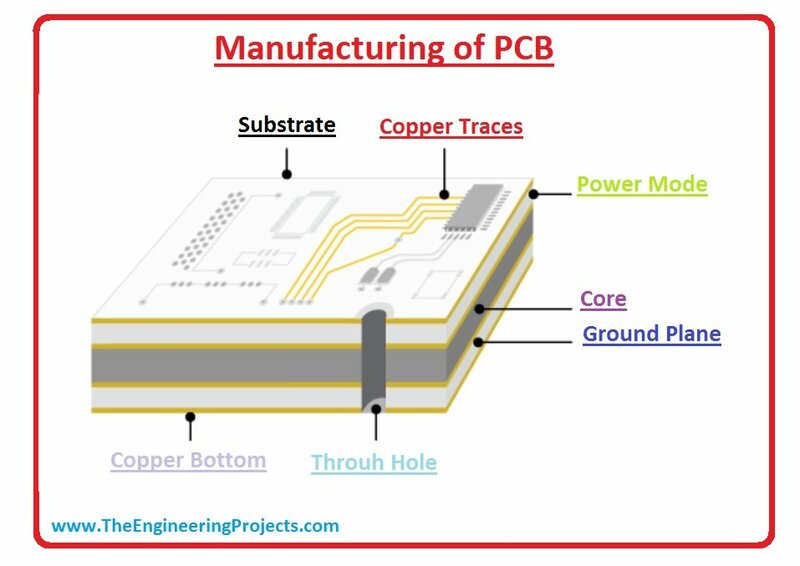 A surface of a PCB may have a coating that protects the copper from corrosion and reduces the chances of solder shorts between traces or undesired electrical contact with stray bare wires. Printed circuit board have multiple copper layer. Two-layer board has copper on both sides, multilayer boards sandwich additional copper layers between layers of insulating material. Pattern to be etched into each copper layer of a PCB is called the “artwork”. PCB design can be mass-reproduced in a way similar to the way photographs can be mass-duplicated from film negatives using a photographic printer. When a PCB has no components installed, it is less ambiguously called a printed wiring board (PWB). A PCB populated with electronic components is called a printed circuit assembly (PCA). Now let’s discuss PCB manufacturing and printing. In the next few lines, we will discuss how PCB is manufactured. But if you don’t want to get into trouble of PCB manufacturing then you can get them manufactured by awesome some PCB company named PCBWay. It’s one of the most trusted PCB services available online. We have had a pretty good interaction since last two years and we always remained satisfied from their servicies. So, I would recommend PCBWay to you for all of your PCB manufacturing. First of all, the designer creates a schematic. A schematic is like a road map for a circuit, it contains a series of symbols that represent of aspect of the circuit. This is helpful for troubleshooting any issue with your PCB. After the Circuit Design is captured in a schematic, it is translated into an electronic design automation (EDA) software package like altium designer. Designed has to supported into industry standard format e.g. the Gerber format,. The resulting file acts as a set of instructions for the production phase of a PCB. After creation of a Gerber file, we make print PCB. Dimensions of PCB, along with how many layer it will have are decided and all of the components are positioned, ground, laid out, and signal traces dictated by the Gerber file. There is a different requirement of a different board, so your PCB designer will tell you whether you need surface mount (SMT), single or double-sided fabrication and more. After all, the process describes above we do, White-box testing will make sure your PCB is structured properly. The goal here is to test every possible output to ensure the PCB is functioning, the designer intended it to. 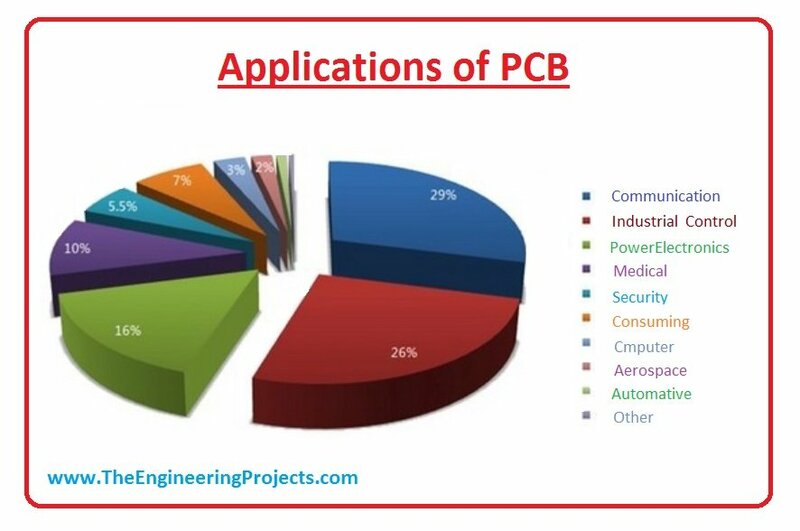 For better under as standing of PCB manufacturing and its part, lets have a look at its figure. 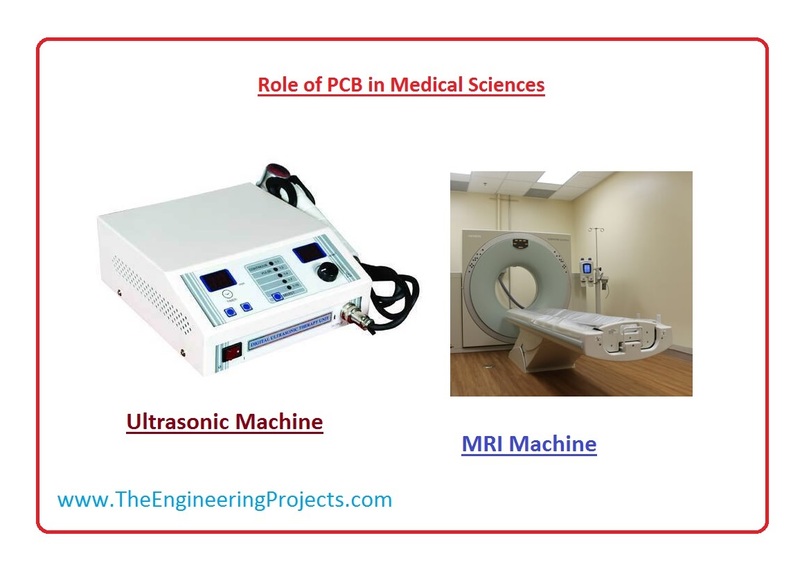 It will be interesting for you that PCB is not only playing a role in Electrical and Electronics industries, but it also plays an important role in Medical Science. Lets discuss its important role in Medical life. The range of printed circuit boards applications in the medical field is vast and ever-growing. You can find medical printed circuit board in everything from pacemakers, defibrillators and heart monitors in the case of cardiovascular medical specification PCBs, to medical imaging systems, CT scans, MRI, ultrasonic equipment and more. You will also find PCBs for a medical device like blood glucose monitors, temperature monitor and electrical muscles stimulation equipment. Professionals of Medical Industry will often select flex or rigid-flex PCBs for their important medical devices. This is because medical devices often do not conform to typical standards of PCB size, shape and medical device professionals will want to make sure their printed circuit boards can fit into as small of an area as possible while still remaining resistant to damage. In the given figure, these are some devices which uses PCB. Now a days PCB has become most important in our modern life. It uses in almost each and every electrical and electronics component. These are some applications of PCB. PCB based Aluminum used in different electronics devices such as computer and in cars indicators. It also used in consumer instruments such as mobile, smartphones and computers. PCB also used in medical industry equipment such as ultrasonic, machine, MRI etc. In industry, it has its applications in Dashboards, Engine Management Systems (EMS), power supplies, in car entertainment, fuel regulators, heater controls, and satellite navigation. So this all about Role of PCB in modern Life. I hope you liked this tutorial. If you have any question please ask in a comment, I will resolve your query. Thanks for reading. Take care….